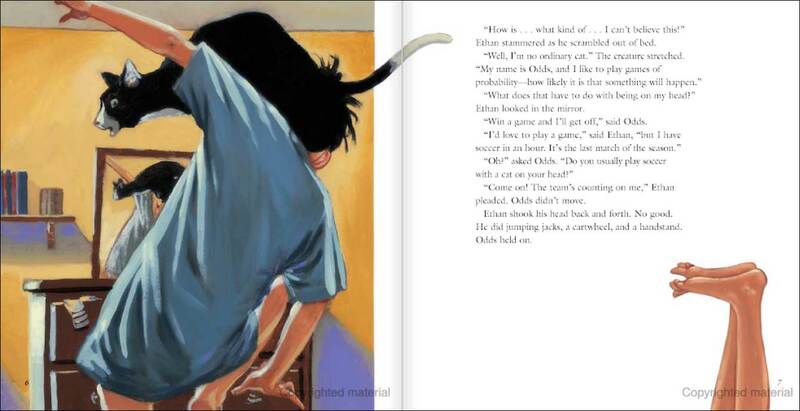 In A Very Improbable Story, Ethan wakes up one morning to find a cat perched on his head, and is stunned when he discovers that not only does the cat talk, but it refuses to jump down until Ethan beats him in a game of probability. 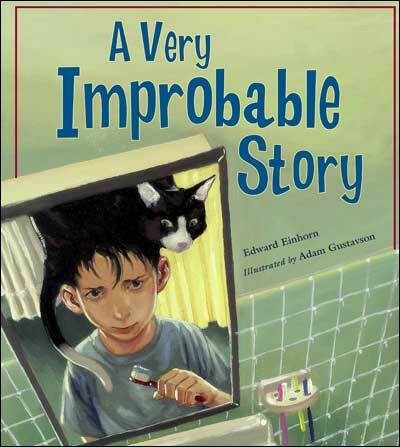 The two then play a series of probability games that are told in quirky text and offbeat but appealing illustrations. At first, Ethan is simply guessing at solutions, but eventually he begins to consider odds and outcomes and does much better. We don't love this book, but it could be good for probability lessons. The probability scenarios are kid-friendly and the oil paintings add a great deal to the storyline. If you do plan to use this title for teaching probability, we recommend you stop and discuss the scenarios as you come to them. 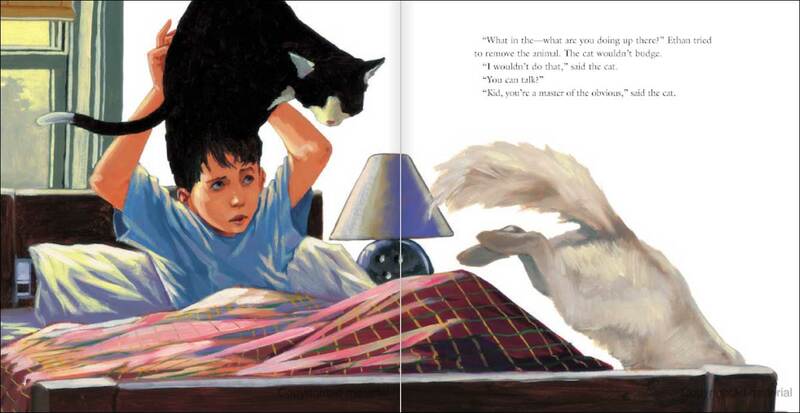 The book moves fairly quickly, and kids may just listen to the story and miss the math lesson entirely. Kids in second and third grade will likely need this bookto be a read-aloud rather than for individual reading, as the reading level will be too high for the majority of them. On average, kids read books on the reading level of this book at the end of third grade. The majority of fourth and fifth graders will be able to read this book on their own. Here's a peek inside A Very Improbable Story -- to give you an idea of what the interior illustrations look like as well as the quantity of text per spread. 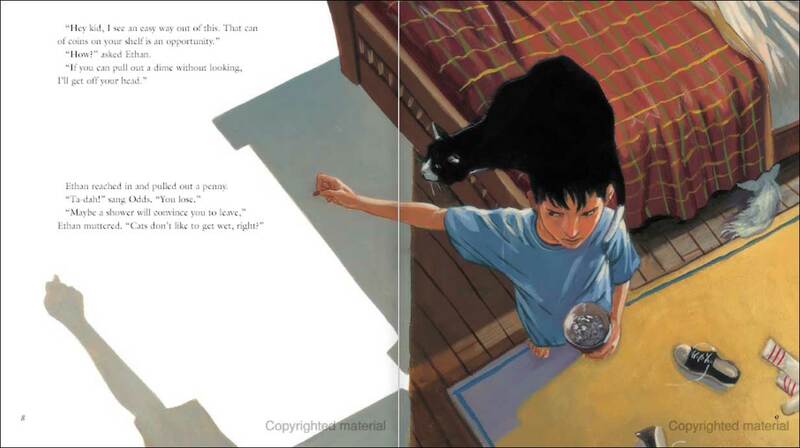 The first spread occurs at the beginning of the book, when the boy wakes up and is startled to find a cat perched on his head---and not just any cat, a talking cat. The third spread depicts a probability scenario with coins. This is early on in the book, when the boy is simply guessing and hoping to get the right answer, not considering odds and outcomes. You can also do the coin jar, but the book doesn't really give all the details for that scenario (how many coins in the jar of each amount, etc) so we skipped that one. You can also use the same items (the socks, the marbles, etc) with different amounts to create new probability scenarios.